…and a proselytizing flying pig. 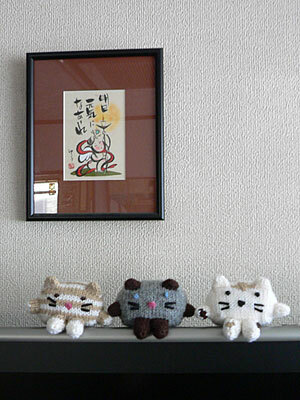 …before retiring to their permanent homes. Calico went to my mother-in-law, Siamese to my aunt-in-law, and Striped Tabby went to my sister-in-law. 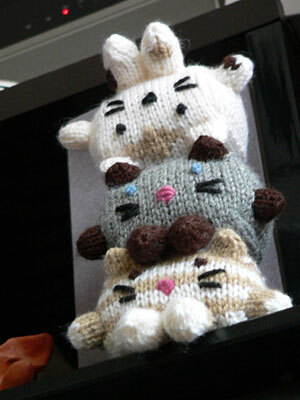 This is the third time I’ve knit one of Anna’s patterns and it is once again very clear and produces adorable results. 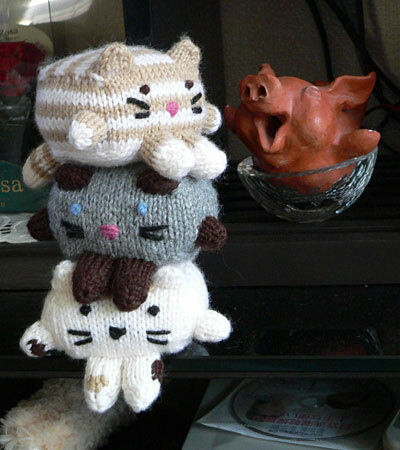 I did make a few modifications when knitting the striped tabby. If you do a straight 2-row alternating stripe as suggested in the pattern, you’ll wind up with one very fat 4-row stripe after picking up stitches to make the rest of the body. So I made the first stripe only one row thick and then resumed alternating 2-row stripes. You still wind up with a 3-row stripe (which you can see at the top of the cat’s head), but I thought that was less noticeable. 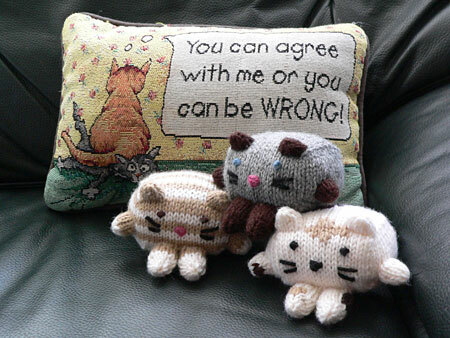 In addition, the join will wind up at the front of the cat, so I knit an extra half-round to push it to the back, where the jog would be less prominent. I also finished up the last part of the body—the flap that becomes the bottom of the cat—all in white instead of in stripes. 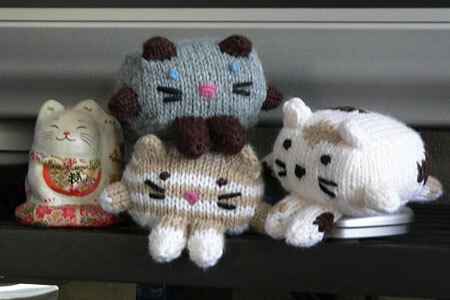 CogKnition posted this on October 17th, 2009 @ 9:36pm in Toys | Permalink to "Stackable Cats"
These are so cute and lovely! !